Make the most of the sunny weather with a light summer tomato bulgur salad bowl recipe. This recipe from Local Food Surrey member and How to Cook Good Food's Laura Scott makes the most of the great seasonal produce now on offer. Heat the oil in a wide saucepan with a well fitting lid then fry off the onion over a medium/low heat until softened but not coloured. Add in the fresh tomato, dried oregano and the tomato paste then continue to fry for another 2 minutes. Pour in the bulgur wheat, stir well into the onion mix then add the vegetable stock. Bring the mixture to the boil, place the lid on the pan then turn down the heat to a low setting and cook for around 17 minutes. 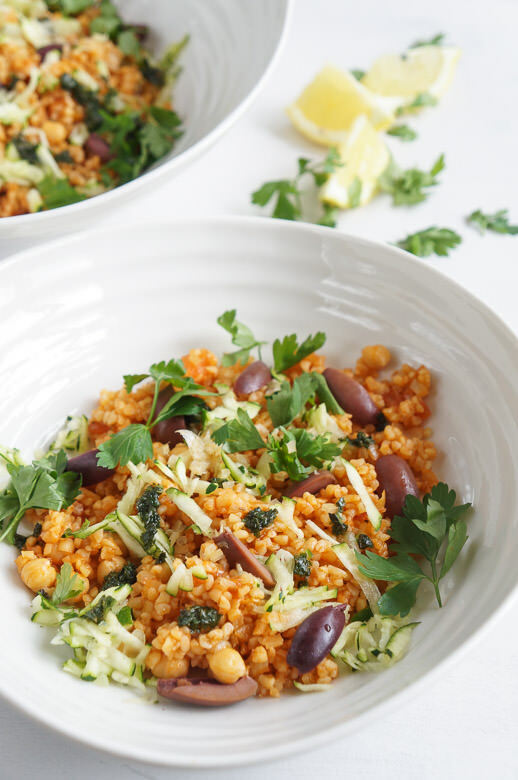 When the bulgur is cool place it into a serving bowl and garnish with the chickpeas, grated courgette, parsley, preserved lemon and olives. Serve with lemon wedges to squeeze over the salad before eating. Laura Scott has lots of plans over the coming months, so click away to find out more about her business How To Cook Good Food and The Epsom Supper Club.